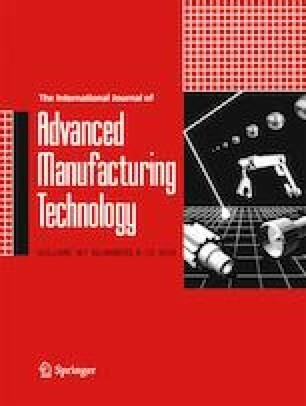 The objective of this research is to experimentally evaluate the lubrication performances of different nanofluids in milling titanium alloy Ti-6Al-4V. Six types of nanofluids, namely, Al2O3, SiO2, MoS2, CNTs, SiC, and graphite, were selected. Cottonseed oil was used as the base oil. The lubrication performance was investigated in terms of milling force, surface roughness, and morphology of workpiece surface. Experimental results demonstrated that the Al2O3 nanoparticle obtained the minimal milling force (Fx = 277.5 N, Fy = 88.3 N), followed by the SiO2 nanoparticle (Fx = 283.6 N, Fy = 86.5 N). The surface roughness obtained by the Al2O3 nanofluid was the minimum (Ra = 0.594 μm), whereas it was the maximum by using minimum quantity lubrication (Ra = 1.772 μm). The surface roughness of the six nanofluids was described by the following order: Al2O3 < SiO2 < MoS2 < CNTs < graphite < SiC. The workpiece surface morphology was the best for Al2O3 and SiO2. The viscosity of the nanofluids was also analyzed. Spherical Al2O3 and SiO2 nanoparticles improved the lubrication effect of base oil mostly and were more suitable as environment-friendly additives for the base oil compared with the others. • Lubrication performance of different nanofluids in milling Ti-6Al-4V was studied. • The surface integrity of six typical nanoparticles were studied. • EDS elements of different nanoparticles were analyzed to validate lubrication performance. • The best lubrication performance was obtained by Al2O3 and SiO2 nanofluid MQL. This research was financially supported by the following organizations: the National Natural Science Foundation of China (51806112 and 51575290); Shandong Provincial Natural Science Foundation, China (ZR2017PEE002 and ZR2017PEE011); and the Scientific Research Development Project of Shandong Higher Education Institutions, China (J18KA017 and J17KB016).